Is the Fed Raising Interest Rates Too Quickly, Putting Economy at Risk? President Trump criticized the Federal Reserve again last week, singling out the central bank as the “biggest threat” to his administration’s success. Earlier, he accused the Fed of having “gone crazy” by raising interest rates too quickly. Many long-time Fed watchers were taken aback by these candid remarks, since previous Presidents have deliberately refrained from commenting on the Fed’s policy actions. Still, President Trump has a legitimate concern. Federal Reserve officials see higher interest rates as necessary to prevent inflation from rising. But higher rates also make borrowing costlier for households who want to buy new homes and cars, and businesses who want to expand and create more jobs. Thus, the President’s remarks invite us to ask if there is any truth to the charge that the Fed is raising rates too quickly and thereby putting the economic expansion at risk. Fortunately, the latest data suggest that the Fed has not “gone crazy.” Recent interest rate increases are justified, given the renewed strength of the U.S. economy. The graph below appears in the position paper I prepared for last week’s meeting of the Shadow Open Market Committee, a group of independent economists that meets regularly to comment on Federal Reserve policy. It shows the annual growth rate of nominal GDP in the United States extending back to 1990. Nominal GDP measures the total dollar value of all goods and services produced in the economy, quarter by quarter. It also measures total income earned by U.S. workers and businesses over the same periods. For two reasons, nominal GDP growth provides valuable information about the economy’s renewed strength and about the Federal Reserve’s role in supporting that strength—which is precisely the President’s concern. First, nominal GDP growth is the sum of two components: real GDP growth and inflation. It therefore synthesizes in a single statistic how well the Fed is doing in meeting both sides of its dual mandate for maximum sustainable growth with low inflation. Second, as a “nominal variable”—that is, one measured in dollars—nominal GDP growth is under the Fed’s control in the long run because the Fed manages the money supply by setting interest rates. When the Fed allows the money supply to increase rapidly, more dollars are available to pay for the same goods and services, causing nominal GDP to grow more quickly, too. Conversely, when the Fed acts to slow down the growth rate of the money supply, nominal GDP growth decelerates as well. Thus, trends in nominal GDP growth provide valuable information about whether the Fed’s monetary policy is too expansionary, too contractionary, or just right. To place the most recent data in historical context, red and green lines in the graph show averages over two distinct periods. The first, running from 1990 through 2007 and marked by the green line, shows that nominal GDP growth averaged 5.3 percent per year before the financial crisis. The second, running from 2010 through 2017, excludes the worst years of the crisis and recession to focus on the stubbornly slow recovery that followed. 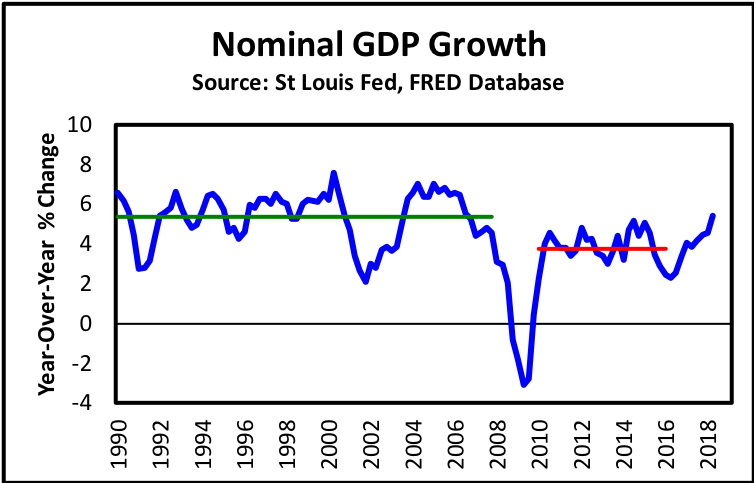 During that period, the red line shows that average nominal GDP growth ran 1.5 percentage points lower, at only 3.8 percent per year. Since nominal GDP growth is a variable that the Fed should be able to control over periods as long as seven years, it appears from this comparison that, despite holding interest rates close to zero and expanding the size of its balance sheet massively through three rounds of quantitative easing, the Fed struggled to deliver needed monetary stimulus to the economy during and after the crisis and recession. Even more striking, however, is how much economic and monetary conditions have improved recently. As the graph clearly shows, nominal GDP growth has been trending steadily upward since the beginning of 2017. In fact, over the more recent four quarters for which data are available, from mid-2017 through mid-2018, nominal GDP grew by 5.4 percent, which is almost equal to the average rate at which it grew prior to the crisis. This number shows that U.S. economic performance has returned to what used to be considered normal—and, despite higher interest rates, Fed policy is now supporting, rather than holding back, the economic expansion. This brings us back to President Trump, who surely has played an important role, too, in helping the economy return to normal by championing tax reform and reducing the regulatory burden on American businesses. But with the economy returning to normal, it stands to reason that Federal Reserve policy should return to normal as well. The Fed’s interest rate target, now just above 2 percent, remains quite low by historical standards. If the Fed gives in to President Trump’s urging, and continues to hold interest rates low as robust economic performance continues, nominal GDP growth will accelerate even further. Inflation will then overshoot the Fed’s target, requiring an even more costly correction later on. Based on the nominal GDP growth figures, we know that back in 2016, the Fed was still struggling to provide needed monetary stimulus to the economy. Now, the same indicator reveals that the Fed’s biggest challenge is to scale back the degree of monetary accommodation sufficiently to avoid a costly overshoot of inflation, and the renewed vigor of the economy makes it easier for it to do this. Although on the surface, it may appear as if the President and the Fed are at odds, in fact they are working together to facilitate stronger economic growth with stable prices.